People in the FinTech space like to say that FinTech will disrupt financial services beyond recognition, causing mass disruption of its delivery to consumers. On its own, FinTech won’t. But with artificial intelligence, it will. Artificial intelligence (“AI”) will disrupt all financial services, indeed all of our society. Technically, AI is intelligence created by machines or software, sometimes called machine learning and sometimes confused with robotics. Robotics is just the robotization of something – if it has the capability to learn, then robotics can be AI. The artificial intelligence and robotics market combined was worth US$10.7 billion in 2014 and is expected to be worth US$153 billion by 2020, and to have a disruptive impact of between US$14 to US$33 trillion. The component for just artificial intelligence (without robotics) is worth US$70 billion. AI is a double edged sword – it has perils and promises. The first peril of AI is unemployment. Artificial intelligence will have a significant impact on financial services, proving to be its most disruptive force, the result of which is already evident with global banks closing branches and terminating thousands of financial services personnel. Artificial intelligence is expected to replace 110 million full-time employees globally by 2025 (see McKinsey Global Institute, “Smart computers, skilled robots, redundant people”, May 28, 2013). The US government looked at the studies circulating that project that 50% of jobs would be lost to automation, and found that it is jobs at the lower and mid-range that will come under pressure from automation, hence in financial services it will be large numbers of banking functions, such as bank tellers and customer service representatives at call centers. In a place like Canada, these perils are more exacerbated. As with every country, we will have long periods of time pursuant to which people who are laid off do not re-engage in the workforce. That happens with all innovations that change employment patterns but Canada has a talent gap and brain drain flowing to the US, the UK and Asia and as a result, there will be insufficient numbers of Canadians capable of performing new tech jobs in artificial intelligence. There is a brain drain and talent gap forming because countries such as China, Hong Kong, Singapore, France, Germany, UK and even Thailand are paying or supporting startups to relocate to develop tech. I was speaking at an Asian Development Bank Conference recently and at the Conference, the Government of Thailand offered to pay companies, including the DFI, to relocate to Thailand. The Hong Kong government offers to invest up to 90% of the cost of developing tech if a startup relocates to Hong Kong. We do not have anywhere near a similar level of support for startups in Canada – techies, including those in AI, will go where there is support – financial and ecosystem. According to stakeholder studies (see ICTC, “Artificial intelligence in Canada, where do we stand?”, April 2015; The Globe and Mail, “Canada risks losing its lead in artificial intelligence to Silicon Valley”, December 17, 2015), Canada does not support artificial intelligence R&D investment in the private sector to the extent needed. In the US in 2015, the private sector invested US$2.4 billion in artificial intelligence and the US public sector invested US$200 million. The US government has commented that, in its view, despite that level of investment, it is not investing enough in artificial intelligence and it acknowledges that there is room to improve and to invest a lot more in AI. Canada is facing a double whammy of mass unemployment with an inability to shift the unemployed masses, or at least part of them, to new tech jobs to balance the negative effects of artificial intelligence and its automated applications. In other words, not only will Canada have mass unemployment like everyone else but our industries will have to buy tech in artificial intelligence from other countries. 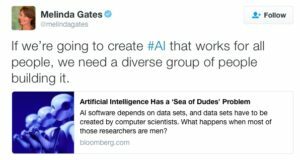 Another peril not often discussed is the diversity bias of artificial intelligence. Most of the programming in the space is done by men and as a result, the machines are being coded with a reality of the view of men, and in a way that is not inclusive, a problem that Melinda Gates recently remarked upon. 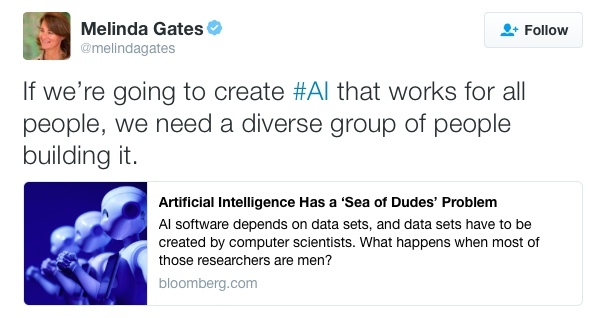 If you think about artificial intelligence in the commercial realm where men are coding machine learning for women (e.g., the online shoe store that uses AI) – there’s no way a “sea of dudes”, as Melinda Gates called them, will know how to appeal to female consumers in coding no matter how long they work at it. It’s appropriate to have diversity in artificial intelligence. Much of the high level tech being created everywhere is done with some level of government financial support. Governments should require that when they invest in AI tech, the startups create AI with diversity. The spending of tax dollars should reflect all taxpayers. Another peril of artificial intelligence is that it is being created in a vacuum without the input of jurists and without consideration of the ethics that arise from its use. If artificial intelligence is going to transform whole societies, the coding and training of the machines needs to be done in a way that reflects the ethics and values of our society. If it is created with goals that are different from ours, there may be adverse consequences. There will also very likely be rogue coders who will code some artificial intelligence to be harmful, or obviously, coders who can hack into artificial intelligence systems to re-code for destructive conduct that harms humanity, or destroys infrastructure, or locates a target and uses artificial intelligence to kill a person. A politician who is uber connected and uses an automated medicine dispenser, for example, in a hospital setting, could be exterminated remotely. We don’t have laws for that, surprisingly- murder by AI. AI also needs to be done in a way that comports with the constitutional values of society, as well as in a manner that addresses inherent issues of law involved in the technology itself. For example, an autonomous dispute resolution system can be neutral but would have to have the rule of law and natural justice coded into it, otherwise the whole system would be unconstitutional. It is important that ethics and law be part of the coding and development of artificial intelligence at tech companies going forward. Not much of a marriage is taking place between the world of tech and law, and that should change. To meet the needs of artificial intelligence in the future, the US, among other things, is funding startup innovation challenges in artificial intelligence. In the US, previous startup challenge funding is credited with accelerating the development of autonomous cars. The US also heavily funds research grants across a broad range of institutions. Iran funds R&D in artificial intelligence in a myriad of ways, including at the high school and university level, with startup grants and low interest loans and with the participation of startups and students at international competitions. It also funds startup co-working spaces at universities where students can create high tech for free with access to talent at universities. It’s no surprise that Iran won most of the awards at the recent international RoboCup 2016. The UK is a growing artificial intelligence hub with support from the UK government and the university sector. The educational component in the UK also includes networks to teach children about coding (see The Guardian, “Artificial intelligence brings its brains to London”, March 5, 2106). Iran also has a strong university sector that supports science, engineering, computer science and specifically, artificial intelligence. There are approximately 40 students in tech in Iran per 1,000 university students, and close to 5 million students per year, mostly women, just in STEM in Iran (see Tradestreaming.com, “Iran to take leading tech role as it rejoins the global finance community,” April 25, 2016). One of the biggest advantages that many countries have, such as Germany, Austria, Iran, China and the US, is a cultural appreciation for a specific type of talent needed for artificial intelligence, namely people in specialized fields who have a high IQ. Artificial intelligence requires the use of a country’s smartest people in difficult and intellectually challenging disciplines (medicine, law, philosophy, engineering and computer science). Culturally speaking, some Canadians, and in particular, the government agencies, are uncomfortable recognizing gifted people with a high IQ. Canadians (except Quebeckers) also have difficulty giving recognition to their own talented people until they gain recognition in another country. Elon Musk, pictured above at Queen’s University when he was an undergraduate there, who created PayPal, SpaceX and Tesla in the US, is an example. We need to get over that. Canada drives away brainiacs year after year and unfortunately, has been known to drive away incredibly intelligent immigrants who move to Canada. Take, for example, Leila Araghian, the architect from Tehran who built the famous Tabiat Nature Bridge in Tehran at 26-years-old, and while a student. The Tabiat recently won a prestigious prize for architecture in New York. Ms. Araghian immigrated to Canada and moved to Vancouver. Despite being top of her class and already a celebrated architect, she could not find work in engineering or architecture, or support in Canada as a woman architect and moved back to Iran (see The Guardian, “Tabiat Bridge: the Tehran architect striking the right chord in Iran”, April 20, 2015). There is something very wrong with our national diversity and inclusion agenda in Canada when we fail to support Canadian women who excel in highly intellectual fields, including our new immigrants, to the extent that they feel compelled to leave Canada for good and give the gift of their brains to another country which is more appreciative of their talent. While AI has perils, it also has promises and significant benefits. Food, beverage and alcohol industries where artificial intelligence will be used to improve food, beverage and alcohol production as well as consistency of food and beverage products, and lead in prompting sales to consumers. The most promising area is humanity tech where technology can be used to improve upon human life, or eliminate human suffering. Using artificial intelligence in rehabilitation and for diminished capacity is one such area. Japan and Iran are quite engaged in the area of robotics with artificial intelligence for rehabilitation purposes. In medicine, artificial intelligence has enormous applications in rehabilitation, for example, in recovery of patients facing joint replacements to facilitate post-operation mobility and to intelligently play a role in smart autonomous home medication management. Iran has a robot called Surena that is developed specifically for humanitarian aid, which could not only save millions in the costs of delivery of supplies but also in physical care in disaster zones where it may be unsafe for humans to venture. For humanitarian purposes and criminal law combined, artificial intelligence could be used for evidence in ways we have not yet imagined, for example, to review evidence in cases of wrongful convictions to systematize such evidence to determine if theories of evidence are valid or not, which would take the human guesswork out of the exercise. How is all this related to FinTech? But what does all this have to do with FinTech? It has everything to do with FinTech because every application of artificial intelligence at the consumer level, if it involves self-applications, will require a payments component. That payments component will likely have to be machine-to machine, and thus tech that is already machine-to-machine, such as distributed ledger technology, will become key. For example, if you consider automated surgeries that the US is working on, it will require a payment by a consumer to the surgical machine; so will your self-driving car when it parks under a building to pick you up; so will the carebot helping you recover from a broken leg; and so will the mechanical lawyer spitting out a machine-written legal opinion on whether you have a strong case or not. When there is a consumer application of artificial intelligence, its FinTech, folks, because its not going to be free. There is untapped potential between the integration of FinTech and artificial intelligence in that respect. M2M requires some digital identity integration. The lack of national digital identity hampers efforts to modernize and broaden financial services (see CNN, “National ID may facilitate financial inclusion,” May 25, 2016), particularly in the sphere of M2M payments that are connecting artificial intelligence services customers over the Internet. No firm that I am aware of in the world is in this space (the nexus between the consumer applications of artificial intelligence, M2M payments and FinTech) as a business application – there’s no reason why Canada can’t be the first in this space. If we prepare for that future now and invest in artificial intelligence, Canada could truly be a global leader.